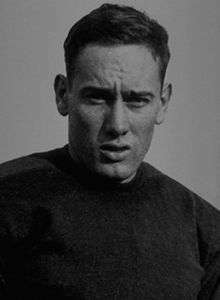 Don "Midnight" Miller (March 29, 1902 – July 28, 1979) was an American football player and coach. He was one of the famous "Four Horsemen" of the University of Notre Dame's backfield in 1924. Miller was inducted into the College Football Hall of Fame as a player in 1970. Miller's three brothers attended Notre Dame before him. The most famous of these being Red Miller, captain of the 1909 squad. Notre Dame head coach Knute Rockne called Miller "the greatest open field runner I ever had." After his playing career, he coached at several colleges, including Georgia Tech. He eventually decided to quit coaching and pick up his career in law, in which he was successful in the Cleveland area. In 1925, he played professional football for the then-independent Hartford Blues. On February 5, 1957, Miller appeared on To Tell the Truth. ↑ Hogrogian, John (1982). "The Hartford Blues Part I" (PDF). Coffin Corner. Professional Football Researchers Association. 4 (8): 1–5. ↑ "NCAA Football's Finest" (PDF). NCAA. 2002. Retrieved 2010-07-02.